Astronomers have discovered a distant body that’s more than 100 times farther from the Sun than Earth is. Its provisional designation is 2018 VG18, but they’ve nicknamed the planet “Farout.” Farout is the most distant body ever observed in our Solar System, at 120 astronomical units (AU) away. The International Astronomical Union’s Minor Planet Center announced Farout’s discovery on Monday, December 17th, 2018. This newly-discovered object is the result of a team of astronomers’ search for the elusive “Planet X” or “Planet 9,” a ninth major planet thought to exist at the furthest reaches of our Solar System, where its mass would shape the orbit of distant planets like Farout. The team hasn’t determined 2018 VG18’s orbit, so they don’t know if its orbit shows signs of influence from Planet X.
Astronomers have found a new dwarf planet way out beyond Pluto that never gets closer than 65 AUs to the Sun. It’s nicknamed “The Goblin” which is much more interesting than its science name, 2015 TG387. The Goblin’s orbit is consistent with the much-talked-about but yet-to-be-proven Planet 9. The Dawn probe continues to excite and amaze! Since it achieved orbit around Ceres in March of 2015, it has been sending back an impressive stream of data and images on the protoplanet. In addition to capturing pictures of the mysterious “bright spots” on Ceres’ surface, it has also revealed evidence of cryovolcanism and the possibility of an interior ocean that could even support life. Most recently, the Dawn probe conducted observations of the protoplanet while it was at opposition – directly between the Sun and Ceres surface – on April 29th. From this position, the craft was able to capture pictures of the Occator Crater, which contains the brightest spot on Ceres. These images were then stitched together by members of the mission team in order to create a short movie that showcases the view Dawn had of the planet. The images were snapped when the Dawn probe was at an altitude of about 20,000 km (12,000 mi) from Ceres’ surface. As you can see (by clicking on the image below), the short movie shows the protoplanet rotating so that the Occator Crater is featured prominently. This crater is unmistakable thanks to the way its bright spots (two side by side white dots) stand out from the bland, grey landscape. This increase in brightness is attributable to the size of grains of material on the surface, as well as their degree of porosity. As scientists have known for some time (thanks to the Dawn mission data) these bright spots are salt deposits, which stand out because they are more reflective than their surrounding environment. But for the sake of movie, this contrast was enhanced further in order to highlight the difference. The observations were conducted as part of the latest phase of the Dawn mission, where it is recording cosmic rays in order to refine its earlier measurements of Ceres’ underground environment. In order to conduct these readings, the probe has been placed through an intricate set of maneuvers designed to shift its orbit around Ceres. Towards the end of April, this placed the probe in a position directly between the Sun and Ceres. Based on previous data collected by ground-based telescopes and spacecraft that have viewed planetary bodies at opposition, the Dawn team predicted that Ceres would appear brighter from this vantage point. But rather than simply providing for some beautiful images of Ceres’ surface, the pictures are expected to reveal new details of the surface that are not discernible by visual inspection. For more than two years now, the Dawn probe has been observing Ceres from a range of illumination angles that exceed those made of just about any other body in the Solar System. These has provided scientists with the opportunity to gain new insights into its surface features, properties, and the forces which shape it. Such observations will come in very handy as they continue to probe Ceres’ surface for hints of what lies beneath. For years, scientists have been of the opinion that Ceres’ harbors an interior ocean that could support life. In fact, the Dawn probe has already gathered spectral data that hinted at the presence of organic molecules on the surface, which were reasoned to have been kicked up when a meteor impacted the surface. Characterizing the surface and subsurface environments will help determine if this astronomical body really could support life. At present, the Dawn probe is maintaining an elliptical orbit that is taking it farther away from Ceres. As of May 11th, NASA reported that the probe was in good health and functioning well, despite the malfunction that took place in April where it’s third reaction wheel failed. The Dawn mission has already been extended, and it is expected to operate around Ceres until 2017. When Pluto was first discovered by Clybe Tombaugh in 1930, astronomers believed that they had found the ninth and outermost planet of the Solar System. In the decades that followed, what little we were able to learn about this distant world was the product of surveys conducted using Earth-based telescopes. Throughout this period, astronomers believed that Pluto was a dirty brown color. In recent years, thanks to improved observations and the New Horizons mission, we have finally managed to obtain a clear picture of what Pluto looks like. In addition to information about its surface features, composition and tenuous atmosphere, much has been learned about Pluto’s appearance. Because of this, we now know that the one-time “ninth planet” of the Solar System is rich and varied in color. With a mean density of 1.87 g/cm3, Pluto’s composition is differentiated between an icy mantle and a rocky core. The surface is composed of more than 98% nitrogen ice, with traces of methane and carbon monoxide. Scientists also suspect that Pluto’s internal structure is differentiated, with the rocky material having settled into a dense core surrounded by a mantle of water ice. The diameter of the core is believed to be approximately 1700 km, which accounts for 70% of Pluto’s total diameter. Thanks to the decay of radioactive elements, it is possible that Pluto contains a subsurface ocean layer that is 100 to 180 km thick at the core–mantle boundary. Pluto has a thin atmosphere consisting of nitrogen (N2), methane (CH4), and carbon monoxide (CO), which are in equilibrium with their ices on Pluto’s surface. However, the planet is so cold that during part of its orbit, the atmosphere congeals and falls to the surface. The average surface temperature is 44 K (-229 °C), ranging from 33 K (-240 °C) at aphelion to 55 K (-218 °C) at perihelion. Pluto’s surface is very varied, with large differences in both brightness and color. Pluto’s surface also shows signs of heavy cratering, with ones on the dayside measuring 260 km (162 mi) in diameter. Tectonic features including scarps and troughs has also been seen in some areas, some as long as 600 km (370 miles). Mountains have also been seen that are between 2 to 3 kilometers (6500 – 9800 ft) in elevation above their surroundings. Like much of the surface, these features are believed to be composed primarily of frozen nitrogen, carbon monoxide, and methane, which are believed to sit atop a “bedrock” of frozen water ice. The surface also has many dark, reddish patches due to the presence of tholins, which are created by charged particles from the Sun interacting with mixtures of methane and nitrogen. Pluto’s visual apparent magnitude averages 15.1, brightening to 13.65 at perihelion. In other words, the planet has a range of colors, including pale sections of off-white and light blue, to streaks of yellow and subtle orange, to large patches of deep red. Overall, its appearance could be described as “ruddy”, given that the combination can lend it a somewhat brown and earthy appearance from a distance. In fact, prior to the New Horizon‘s mission, which provided the first high-resolution, close-up images of the planet, this is precisely what astronomers believed Pluto looked like. Several different regions (“regio”) have been characterized based on the notable features they possess. Perhaps the best known is the large, pale area nicknamed the “Heart” – aka. Tombaugh Regio (named after Pluto’s founder). This large bright area is located on the side of Pluto that lies opposite the side that faces Charon, and is named because of its distinctive shape. Tombaugh Regio is about 1,590 km (990 mi) across and contains 3,400 m (11,000 ft) mountains made of water ice along its southwestern edge. The lack of craters suggests that its surface is relatively young (about 100 million years old) and hints at Pluto being geologically active. The Heart can be subdivided into two lobes, which are distinct geological features that are both bright in appearance. The western lobe, Sputnik Planitia, is vast plain of nitrogen and carbon monoxide ices measuring 1000 km in width. It is divided into polygonal sections that are believed to be convection cells, which carry blocks of water ice and sublimation pits along towards the edge of the plain. This region is especially young (less than 10 million years old), which is indicated by its lack of cratering. Then there is the large, dark area on the trailing hemisphere known as Cthulhu Regio (aka.the “Whale”). Named for its distinctive shape, this elongated, dark region along the equator is the largest dark feature on Pluto – measuring 2,990 km (1,860 mi) in length. The dark color is believed to be the result methane and nitrogen in the atmosphere interacting with ultraviolet light and cosmic rays, creating the dark particles (“tholins”) common to Pluto. And then there are the “Brass Knuckles”, a series of equatorial dark areas on the leading hemisphere. These features average around 480 km (300 mi) in diameter, and are located along the equator between the Heart and the tail of the Whale. The NH mission launched from Cape Canaveral Air Force Station in Florida on January 19th, 2006. After swinging by Jupiter for a gravity boost and to conduct some scientific studies in February of 2007, it reached Pluto in the summer of 2015. Once there, it conducted a six month-long reconnaissance flyby of Pluto and its system of moons, culminating with a closest approach that occurred on July 14th, 2015. 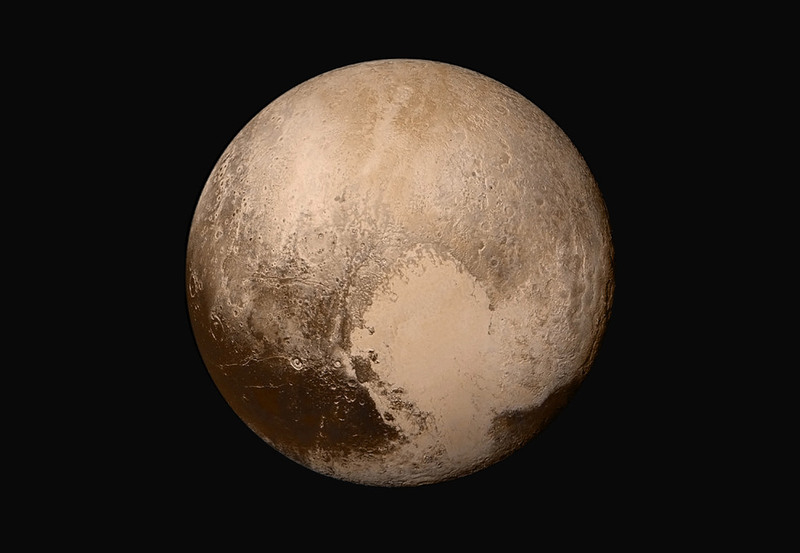 A portrait from the final approach of the New Horizons spacecraft to the Pluto system on July 11th, 2015. Pluto and Charon display striking color and brightness contrast in this composite image. Credit: NASA-JHUAPL-SWRI. The first images of Pluto acquired by NH were taken on September 21st to 24th, 2006, during a test of the Long Range Reconnaissance Imager (LORRI). At the time, the probe was still at a distance of approximately 4.2 billion km (2.6 billion mi) or 28 AU, and the photos were released on November 28th, 2006. Between July 1st and 3rd, the first images were taken that were able to resolved Pluto and its largest moon, Charon, as separate objects. Between July 19th–24th, 2014, the probe snapped 12 images of Charon revolving around Pluto, covering almost one full rotation at distances ranging from 429 to 422 million kilometers (267,000,000 to 262,000,000 mi). After a brief hibernation during its final approach, New Horizons “woke up” on Dec. 7th, 2014. Distant-encounter operations began on January 4th, 2015, and NH began taking images of Pluto as it grew closer. During its closest approach (July 14th, 2015, at at 11:50 UTC), the NH probe passed within 12,500 km (7,800 mi) of Pluto. About 3 days before making its closest approach, long-range imaging of Pluto and Charon took place that were 40 km (25 mi) in resolution, which allowed for all sides of both bodies to be mapped out. Close-range imaging also took place twice a day during this time to search for any indication of surface changes. The NH probe also analyzed Pluto’s atmosphere using its suite of scientific instruments. This included it’s ultraviolet imaging spectrometer (aka. Alice) and the Radio Science EXperiment (REX), which analyzed the composition and structure of Pluto’s atmosphere. It’s Solar Wind Around Pluto (SWAP) and Pluto Energetic Particle Spectrometer Science Investigation (PEPSSI) examined the interaction of Pluto’s high atmosphere with solar wind. Pluto’s diameter was also resolved by measuring the disappearance and reappearance of the radio occultation signal as the probe flew by behind Pluto. And the gravitational tug on the probe were used to determine Pluto’s mass and mass distribution. All of this information has helped astronomers to make the first detailed maps of Pluto, and led to numerous discoveries about Pluto’s structure, composition, and the kinds of forces that actively shape its surface. The mission also led to the first true images of what Pluto looks like up close, revealing its true colors, it’s famous “Heart” region, and the many other now-famous features. We have written many interesting articles about the colors of astronomical bodies here at Universe Today. Here’s What Color is the Sun?, What are the Colors of the Planets?, What Color is Mercury?, What Color is Venus?, What Color is the Moon?, Why is Mars Red?, What Color is Jupiter?, What Color is Saturn?, What Color is Uranus?, and What Color is Neptune? NASA – What is Pluto? A new dwarf planet has been discovered beyond Neptune, in the disk of small icy worlds that resides there. The planet was discovered by an international team of astronomers as part of the Outer Solar Systems Origins Survey (OSSOS). The instrument that found it was the Canada-France Hawaii Telescope at Maunakea, Hawaii. The planet is about 700 km in size, and has been given the name 2015 RR245. It was first sighted by Dr. JJ Kavelaars, of the National Research Council of Canada, in images taken in 2015. Dwarf planets are notoriously difficult to spot, but they’re important pieces of the puzzle in tracing the evolution of our Solar System. “The icy worlds beyond Neptune trace how the giant planets formed and then moved out from the Sun. They let us piece together the history of our Solar System. But almost all of these icy worlds are painfully small and faint: it’s really exciting to find one that’s large and bright enough that we can study it in detail.” said Bannister. As the New Horizons mission has shown us, these far-flung, cold bodies can have exotic features in their geological landscapes. Where once Pluto, king of the dwarf planets, was thought to be a frozen body locked in time, New Horizons revealed it to be a much more dynamic place. The same may be true of RR245, but for now, not much is known about it. The 700 km size number is really just a guess at this point. More measurements will need to be taken of its surface properties to verify its size. “It’s either small and shiny, or large and dull.” said Bannister. As our Solar System evolved, most dwarf planets like RR245 were destroyed in collisions, or else flung out into deep space by gravitational interactions as the gas giants migrated to their current positions. RR245 is one of the few that have survived. It now spends its time the same way other dwarf planets like Pluto and Eris do, among the tens of thousands of small bodies that orbit the sun beyond Neptune. RR245 has not been observed for long, so much of what’s known about its orbit will be refined by further observation. But at this point it appears to have a 700 year orbit around the Sun. And it looks like for at least the last 100 million years it has travelled its current, highly elliptical orbit. For hundreds of years, it has been further than 12 billion km (80 AU)from the Sun, but by 2096 it should come within 5 billion km (34 AU) of the Sun. The discovery of RR 245 came as a bit of a surprise to the OSSOS team, as that’s not their primary role. “OSSOS was designed to map the orbital structure of the outer Solar System to decipher its history,” said Prof. Brett Gladman of the University of British Columbia in Vancouver. “While not designed to efficiently detect dwarf planets, we’re delighted to have found one on such an interesting orbit”. OSSOS has discovered over 500 hundred trans-Neptunian objects, but this is the first dwarf planet it’s found. “OSSOS is only possible due to the exceptional observing capabilities of the Canada-France-Hawaii Telescope. CFHT is located at one of the best optical observing locations on Earth, is equipped with an enormous wide-field imager, and can quickly adapt its observing each night to new discoveries we make. This facility is truly world leading.” said Gladman. If RR 245’s diameter is conclusively measured as 700 km, it will be smaller than the dwarf planet Ceres, which is 945 km in diameter. Image courtesy of NASA. A lot of work has been done to find dwarf planets in the far reaches of our Solar System. It may be that RR 245 is the last one we find. If there are any more out there, they may have to wait until larger and more powerful telescopes become available. In the mid-2020’s, the Large Synoptic Survey Telescope (LSST) will come on-line in Chile. That ‘scope features a 3200 megapixel camera, and each image it captures will be the size of 40 full Moons. It’ll be hard for any remaining dwarf planets to hide from that kind of imaging power. As for RR 245’s rather uninspiring name, it will have to do for a while. But as the discoverers of the new dwarf planet, the OSSOS team will get to submit their preferred name for the planet. After that, it’s up the International Astronomical Union (IAU) to settle on one. What do you think? If this is indeed the last dwarf planet to be found in our Solar System what should we call it? Pluto can’t seem to catch a break lately. After being reclassified in 2006 by the International Astronomical Union, it seemed that what had been the 9th planet of the Solar System was now relegated to the status of “dwarf planet” with the likes of Ceres, Eris, Haumea, and Makemake. Then came the recent announcements that the title of “Planet 9” may belong to an object ten times the mass of Earth located 700 AU from our Sun. And now, new research has been produced that indicates that Pluto may need to be reclassified again. Using data provided by the New Horizons mission, researchers have shown that Pluto’s interaction with the Sun’s solar wind is unlike anything observed in the Solar System thus far. As a result, it would seem that the debate over how to classify Pluto, and indeed all astronomical bodies, is not yet over. How Do We Terraform Ceres? We continue our “Definitive Guide to Terraforming” series with a look at another body in our Solar System – the dwarf planet Ceres. Like many moons in the outer Solar System, Ceres is a world of ice and rock, and is the largest body in the Asteroid Belt. Humans beings could one day call it home, but could its surface also be made “Earth-like”? In the Solar System’s Main Asteroid Belt, there are literally millions of celestial bodies to be found. And while the majority of these range in size from tiny rocks to planetesimals, there are also a handful of bodies that contain a significant percentage of the mass of the entire Asteroid Belt. Of these, the dwarf planet Ceres is the largest, constituting of about a third of the mass of the belt and being the sixth-largest body in the inner Solar System by mass and volume. In addition to its size, Ceres is the only body in the Asteroid Belt that has achieved hydrostatic equilibrium – a state where an object becomes rounded by the force of its own gravity. On top of all that, it is believed that this dwarf planet has an interior ocean, one which contains about one-tenth of all the water found in the Earth’s oceans. For this reason, the idea of colonizing Ceres someday has some appeal, as well as terraforming. All right, maybe not blinking like a flashlight (or a beacon on the tippity-top of a communication tower—don’t even start that speculation up) but the now-famous “bright spots” on the dwarf planet Ceres have been observed to detectably increase and decrease in brightness, if ever-so-slightly. And what’s particularly interesting is that these observations were made not by NASA’s Dawn spacecraft, currently in orbit around Ceres, but from a telescope right here on Earth. Researchers using the High Accuracy Radial velocity Planet Searcher (HARPS) instrument on ESO’s 3.6-meter telescope at La Silla detected “unexpected” changes in the brightness of Ceres during observations in July and August of 2015. Variations in line with Ceres’ 9-hour rotational period—specifically a Doppler effect in spectral wavelength created by the motion of the bright spots toward or away from Earth—were expected, but other fluctuations in brightness were also detected. Watch a video below illustrating the rotation of Ceres and how reflected light from the bright spots within Occator crater are alternately blue- and red-shifted according to the motion relative to Earth. First observed with Hubble in December 2003, Ceres’ curious bright spots were resolved by Dawn’s cameras to be a cluster of separate regions clustered inside the 60-mile (90-km) -wide Occator crater. Based on Dawn data they are composed of some type of highly-reflective materials like salt and ice, although the exact composition or method of formation isn’t yet known. Since they are made of such volatile materials though, interaction with solar radiation is likely the cause of the observed daily brightening. As the deposits heat up during the course of the 4.5-hour Ceres daytime they may create hazes and plumes of reflective particles. Once day turns to night these hazes will re-freeze, depositing the particles back down to the surface—although never in exactly the same way. These slight differences in evaporation and condensation could explain the random variation in daily brightening observed with HARPS.